The “all food” communication axis has just born: these two networks together will reach monthly more than 28 millions food addicted users on social network and more than 4,5 millions unique users on Web. I Love Italian Food, the largest international community of Italian Food Lovers founded in Reggio Emilia and Netaddiction, native digital italian editor and influential food & wine figure in Italy, with its main web magazines iFood.it and Dissapore.com, get together to tell the Italian food in Italy and abroad. The union has been presented in preview yesterday evening May the 8th by Alessandro Schiatti, I Love Italian Food President, and Andrea Pucci, CEO and Founder of Netaddiction, during the “100per100 Italian Experience” event (in the picture above) held at the Lounge I Love Italian Food in a special loft, in Via Dante 14 in Milano. 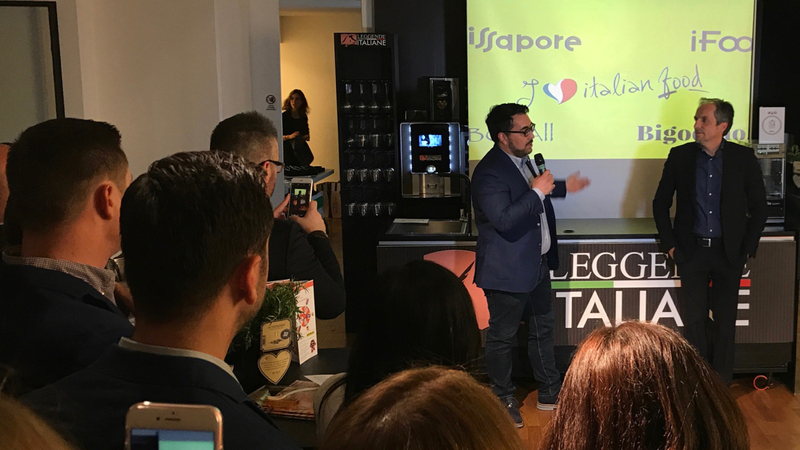 This new partnership signed by I Love Italian Food Srl and Netaddiction aims to reinforce the mission of both the digital realities that keep spreading the Italian food word and telling the Italian excellences all around the world. The partners share the importance of promoting internationally the real Italian cuisine and supporting those producers and companies that believe in the concept of 100% Italian. At the same time, the agreement won’t change the nature of the No Profit Culture Association I Love Italian Food, which will keep creating web contents and acting independently. “Italian companies must sell culture and not only food. Because the Italian cuisine is culture. Food culture must become the black oil of Italy, one of the biggest treasures for our country’s future. That’s what we are trying to do with I Love Italian Food, telling daily the world our food and wine culture. From a small example, we would like to become a big one and this is the reason why we decided to work together with Netaddiction, a capable native digital editor with whom we can improve telling Italian food culture.” says Alessandro Schiatti, Presidente of I Love Italian Food. “We are more than proud to have signed this strategic partnership with I Love Italian Food network. We have been in harmony since the very beginning thanks to the shared passion for Italian food and common objectives of promoting the true Italian excellences around the world and raising the awareness about the power of the made in Italy among Italians. I am sure that together we will reach great results and that our formats will tell the world of Italian food artisans at their best, something that is envied by everybody.” says Andrea Pucci, CEO and Founder of Netaddiction. Both the networks have a remarkable fanbase. Netaddiction group, one of the most dynamic web businesses, reaches more than 16 millions of unique users with its 8 web megazine, and it counts 3 millions of digital fans. The circuit taste&food with Dissapore.com, iFood.it and the new born BBQ4All reaches more than 4 millions users. Moreover, it embraces also Bigodino.it, a platform dedicated to the female public, that counts 2.700.000 unique users and almost 15 millions page views every month. I Love Italian Food is the largest international community dedicated to Italian food and, together with the no profit association, it created more than 30 events in Italy and abroad, reaching more than 250 millions of users. In order to tell the world the true, I Love Italian Food produces daily contents for its digital platform, organises international events to connect with the field experts, creates unique projects for the associate companies and it supports educational and research projects.